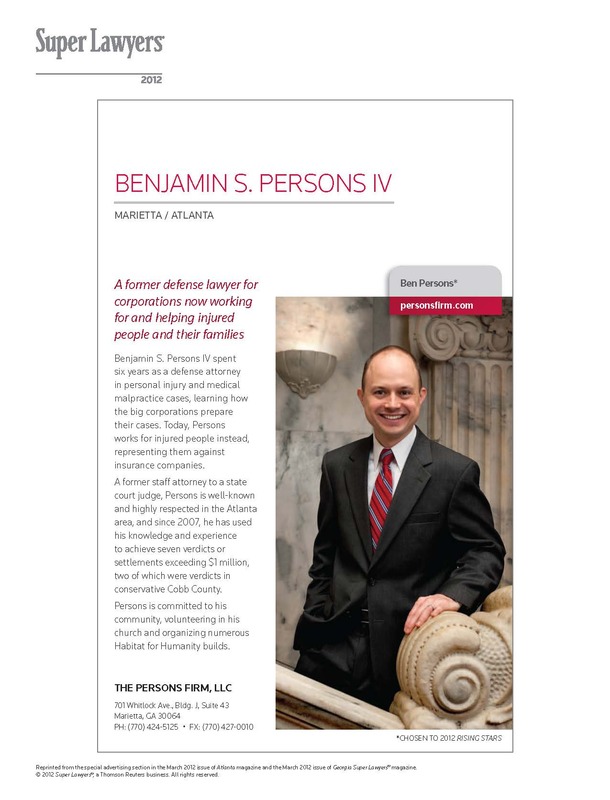 Ben Persons was again recognized as a Super Lawyers Rising Star, 2014 in Atlanta Magazine's "Annual List of the Top Attorneys in Georgia"
The Persons Firm is proud to sponsor Art From the Heart, a fundraiser to benefit the Weekday Ministry School at Marietta First United Methodist. 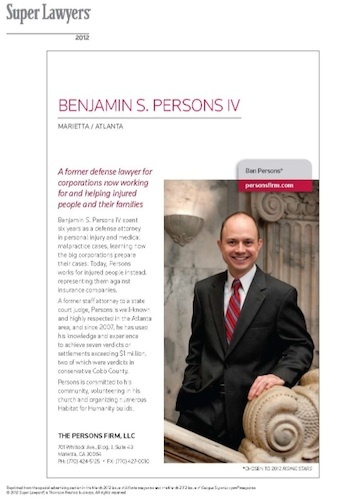 Congratulations to Ben Persons for being chosen a Super Lawyers Rising Star, 2013. 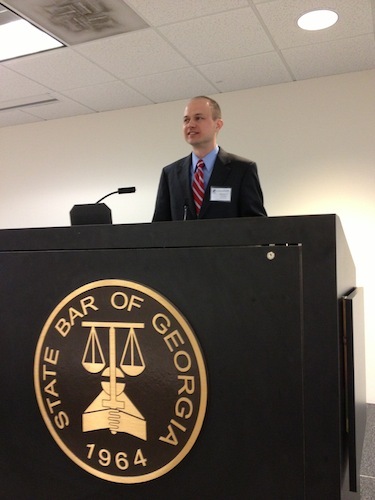 Photograph taken from Atlanta Magazine's "Annual List of the Top Attorneys in Georgia"
Practice Seminar at the State Bar Headquarters in Atlanta. 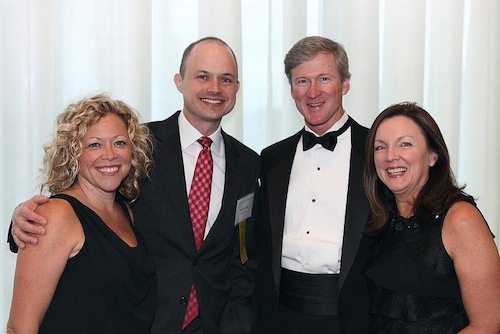 Ben Persons and Amanda Persons at the Georgia Trial Lawyers Association President's Gala. Ben Persons at week four of this year's Habitat build in Marietta, GA.
Lawyer of the Day Program at the Georgia Legislature. The Cobb County Methodist Coalition, in partnership with Heidelberg USA, finished construction of a beautiful home in Mableton, Georgia for a deserving family this month. 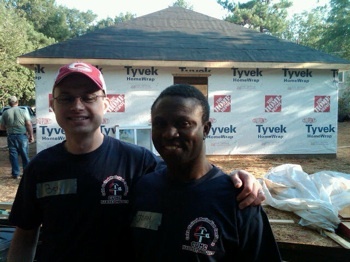 I'm thankful for the NW Metro Atlanta Habitat for Humanity and all the volunteers that gave up their Saturdays to make this home possible for the Buabeng family. 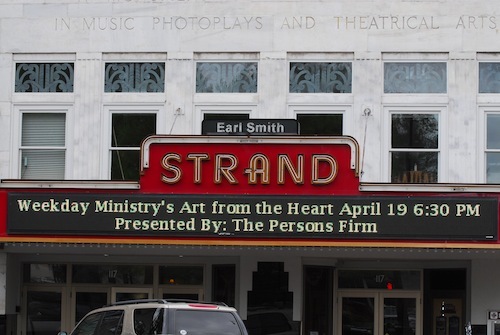 At our dedication ceremony this blessing was read "Lord, be close to your servants who will move into this house. We ask for your blessing. Be their shelter when they are at home, their companion when they are away, and their welcome when they return. May all their days be blessed in this place, and may the desires of their heart come true. Amen." 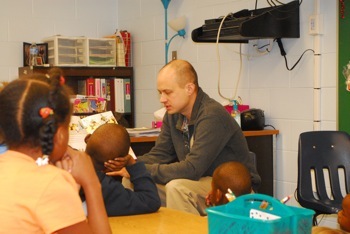 In October, Compton Elementary School, located in Powder Springs hosted a day of hope. The Mayor, City Council, and other community leaders shared success stories and read books to all grade levels. "I was honored by the invitation to participate in Compton's Day of Hope. 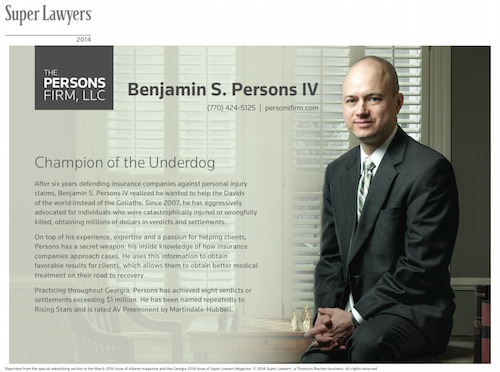 Said attorney, Ben Persons. 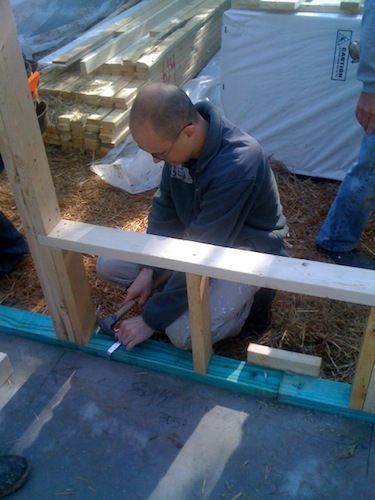 "I was really impressed by the students. You could tell by their questions that these were intelligent children with excellent teachers." 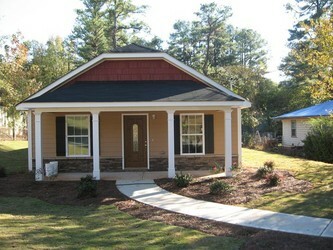 Habitat for Humanity NW Metro Atlanta is currently continuing it's mission of building quality homes for blessed families with the above pictured build in Mableton, Georgia. 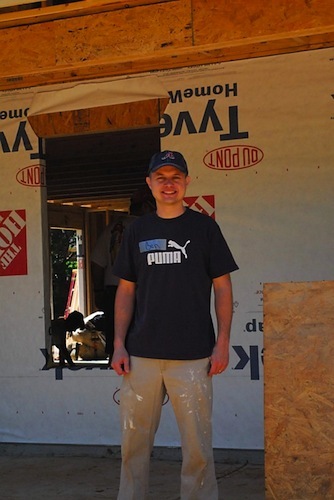 "Habitat is an amazing organization and participating in Habitat builds have been some of the most rewarding experiences of my life. 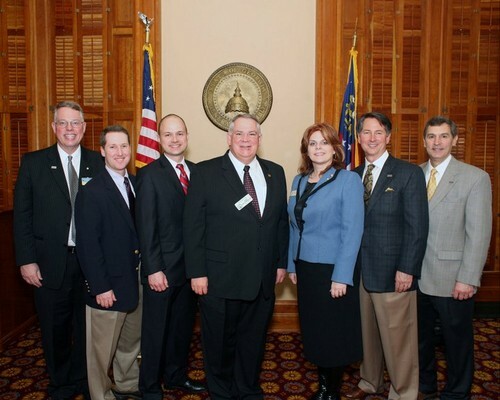 I was honored to be asked to serve as Habitat Chair for 2010 by my church Marietta First United Methodist and hope I live up to the responsibility." 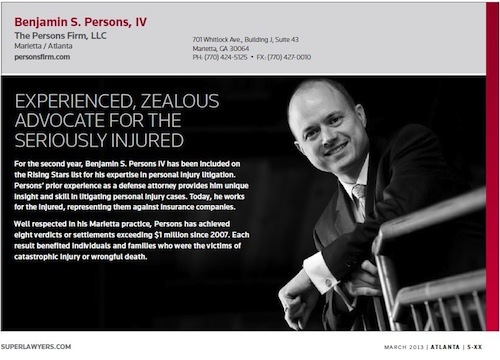 Stated our attorney Ben Persons. 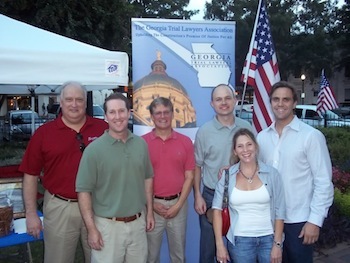 The Cobb County Trial Lawyers Association (CCTLA) and the Georgia Trial Lawyers Association (GTLA) proudly accepted the invitation to help sponsor the Constitution Day Festivities at the Marietta Square on September 17, 2010. 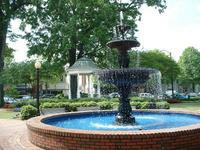 Specifically, we were asked to represent and celebrate the 7th amendment (The Right to Trial by Jury in Civil Cases). GTLA member and CCTLA officer, Ben Persons, attended the event and had this to say: "there are certain big government and business interests that have been trying for years to erode our civil justice system and the right to trial by jury, however, on nights like this it is nice to talk with like minded people that realize civil justice is a true conservative ideal." Mr. Persons further stated: "At the event I read a powerful quote by Thomas Jefferson that really illustrated our need to be there 'I consider trial by jury at the only anchor ever yet imagined by man, by which a government can be held to the principles of its Constitution.'" Congratulations to attorney, Ben Persons, for receiving "Superb, 10 out of 10" rating by the leading lawyer rating service Avvo. 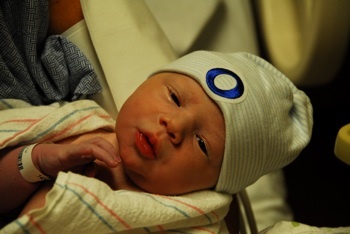 Congratulations to our attorneys Amanda Persons and Ben Persons on the birth of their son Oliver Samuel Persons on June 21, 2010. Both mother and son are doing well. 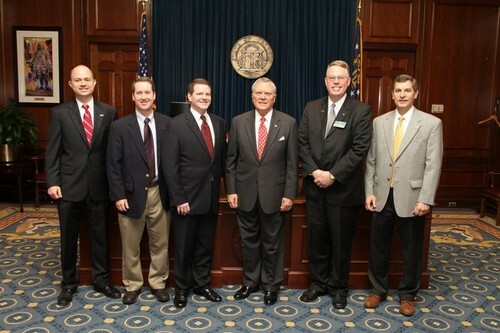 Congratulations to our attorney, Ben Persons, on being selected as Secretary of the Cobb County Trial Lawyers Association. Read Article.